Being successful at poker involves having a great poker betting strategy. Wagering in this age-old game can serve several functions and patterns can be very complex. This holds true in no-limit games, too, in which you not only decide whether to bet or not, but are also free to wager however much you want! Beginners often aren't aware of the reason why they place stakes, let alone the best amount to use in certain situations. A lot of beginners make big mistakes as a result of their poor poker betting strategy, and for that reason alone they find themselves losing money on a structural basis. Besides betting because you feel like it or because it gives you a nice, round figure in your chip stack, there are several other reasons to wager. The most common two are to get value for your good hands, or to bluff. There are also other reasons that are more or less forms of the two mentioned above, such as betting for protection, for information, to gain the initiative, or to block. The correct amount to use in a certain situation depends on why you are wagering in the first place. This is used when you think you have the best hand. You are hoping to get called by your opponents, and that they have a worse hand than yours. You can only make an estimation of a range of hands that your opponent is likely to have. The trick here is to wager an amount that wins you the most - not too much that will scare your opponent off, but not too little, either, and miss out on your opportunity. 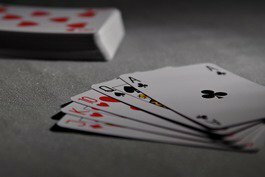 Part of good poker betting strategy is knowing how to bluff when you know you probably don't have the best cards, but you want to try to fool your opponent and win the pot anyway. If you are bluffing, you don't want your opponent to call your hand. The trick here is to get the job done with using as little chips as possible. You don't want to risk more than necessary to scare off your opponent, and you need to be credible.